We have a great lineup of musicians for the 10th Anniversary! Started in 2010 with four performances it has grown to eight weekly performances on Thursdays @ 7 p.m. Kicking us off this year is the country duo Poppa Bear Norton on June 13. 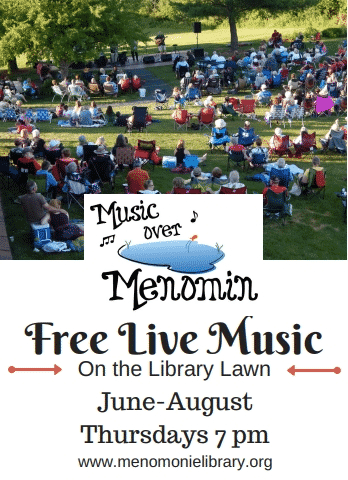 Our Children’s Department and Mayo Clinic Health Systems are partnering to host the 2nd Annual Music Over Menomin Junior for children and their families featuring four performances. Keep in touch by subscribing to our seasonal eNewsletter and special announcements. BookPage is a monthly book review publication distributed to 400,000 avid readers through subscribing bookstores and public libraries. 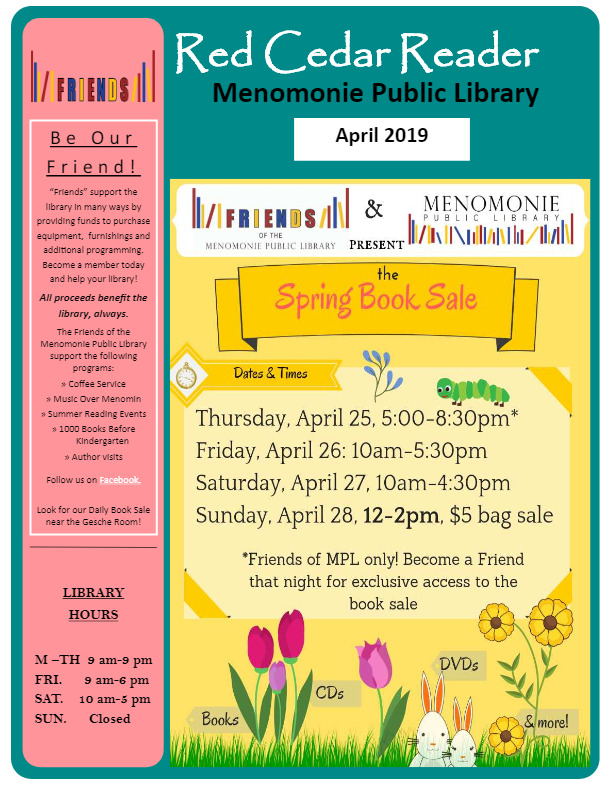 Pick up your free copy at the library courtesy of the Menomonie Public Library Foundation. BookPage is a selection guide to the best new books published every month. 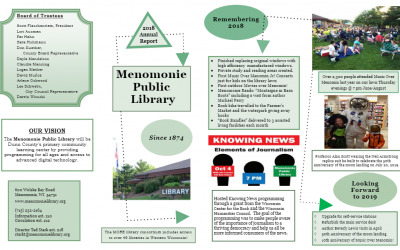 All of the content from the print edition is posted on BookPage.com each month. 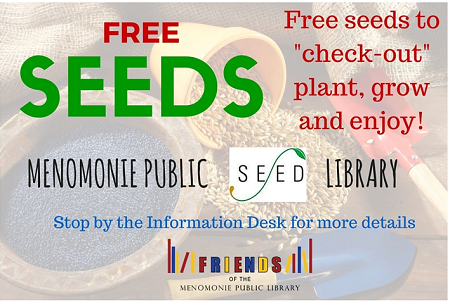 Share book reviews and ratings with Menomonie, and even join a book club on Goodreads. 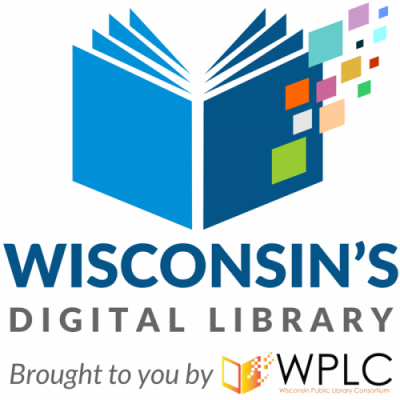 Wisconsin’s Digital Library is brought to you by the Wisconsin Public Library Consortium and is funded by the public libraries and public library systems in the state, with generous support from Library Services and Technology Act (LSTA) funds awarded to the Wisconsin Department of Public Instruction by the Federal Institute of Museum and Library Services….and by donations from patrons like you! 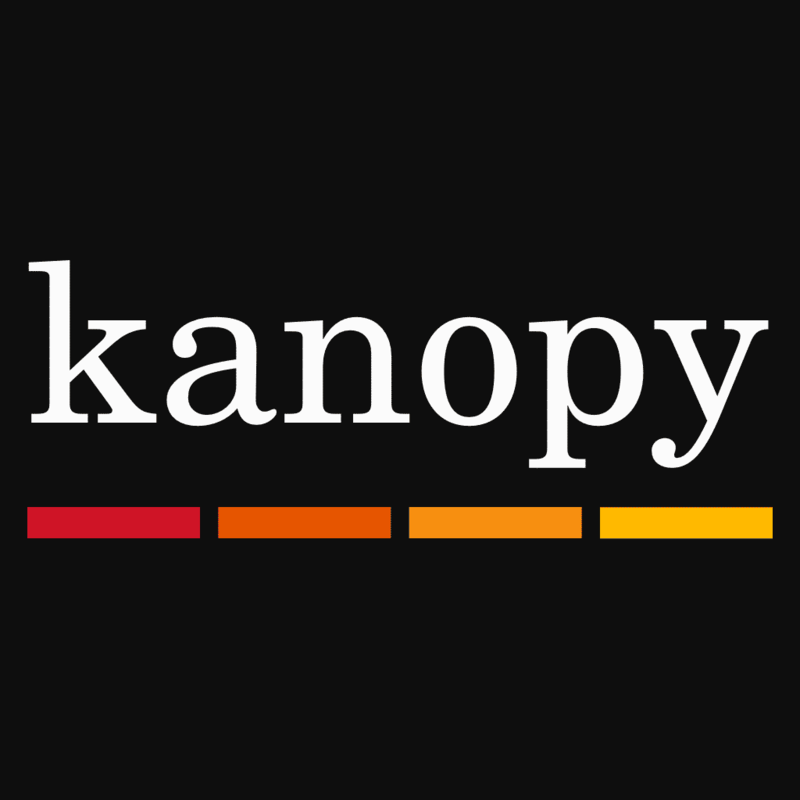 The popular on-demand film streaming service Kanopy is available to Menomonie Public Library card holders. Films can be streamed from any computer, television, mobile device or platform by downloading the Kanopy app for iOS, Android, AppleTV, Chromecast or Roku. 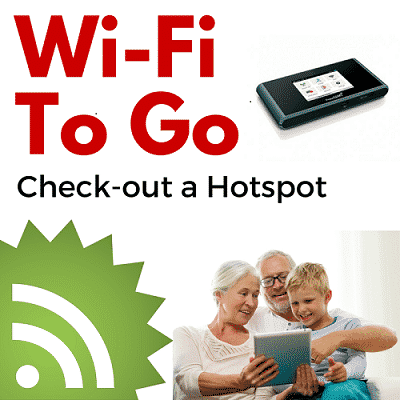 Freading offers tens of thousands of ebooks which are available anytime, anywhere. There is no download manager, and users have simultaneous access to all titles. Apple and Android apps are available. 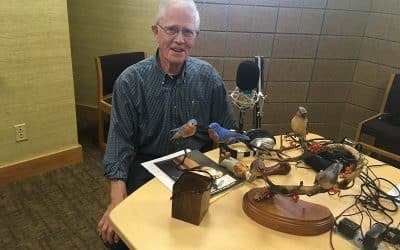 Online access to full-text of the Dunn County News, Eau Claire Leader-Telegram, Chippewa Herald, Pioneer Press, Star Tribune, Milwaukee Journal Sentinel, Capital Times, Wisconsin State Journal and more. 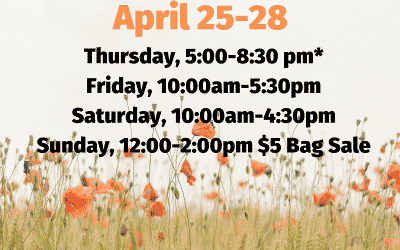 Current and past news content; including local news stories, sports, letters to the editor, editorials, obituaries, real estate info, and special sections. 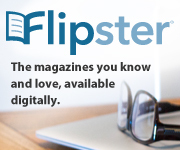 Browse digital versions of the latest issues of popular magazines. An on-demand learning solution designed to help you gain new skills and advance your career. More than 5,000 video tutorials covering business, creative and technology topics, personalized recommendations, expert instructors, and conveniently available day or night from any desktop computer or mobile device. 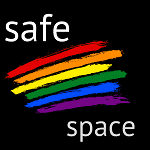 Start speaking and understanding a new language today – on your own terms and in your own time! 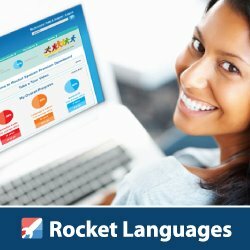 Rocket Languages focuses on a conversational learning approach – our dynamic online language courses have you speaking the language right from the very first lesson.